A few days ago we heard about how the Beats audio group was planning to buyback a controlling interest in the company, leaving HTC with just a 25% stake, but the reason for the move wasn't really that clear. Sure, we got a PR-clean joint statement about the move, but those never really give any real information. Now, we're getting some unofficial word about the reasoning. 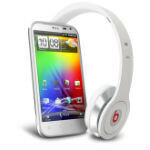 According to sources of CNet, Beats made the move because HTC didn't meet "financial obligations" that were expected. HTC has been having a kind of tough road recently. It's yearly profits were not nearly as good as last year, and the company's new pared-down device lineup hasn't been selling all that well, despite mostly positive reviews for the One series. The move by Beats gives the company better control over its own future, and that may be good, because Beats doesn't seem to trust HTC any more. I dono what htc is trying to do these days. They come up with phones which don multi task and then call it flagship phones and price it steep. Then whats the difference between htc and apple?.